Since I have finished up all of my Adepticon models for the year, I've been really stoked to work on several different projects. Here's a pic of each, just to show you the extreme level of my Warhammer/hobby ADD. These will be in order of my current excitement level for each one (which pretty much changes hourly). 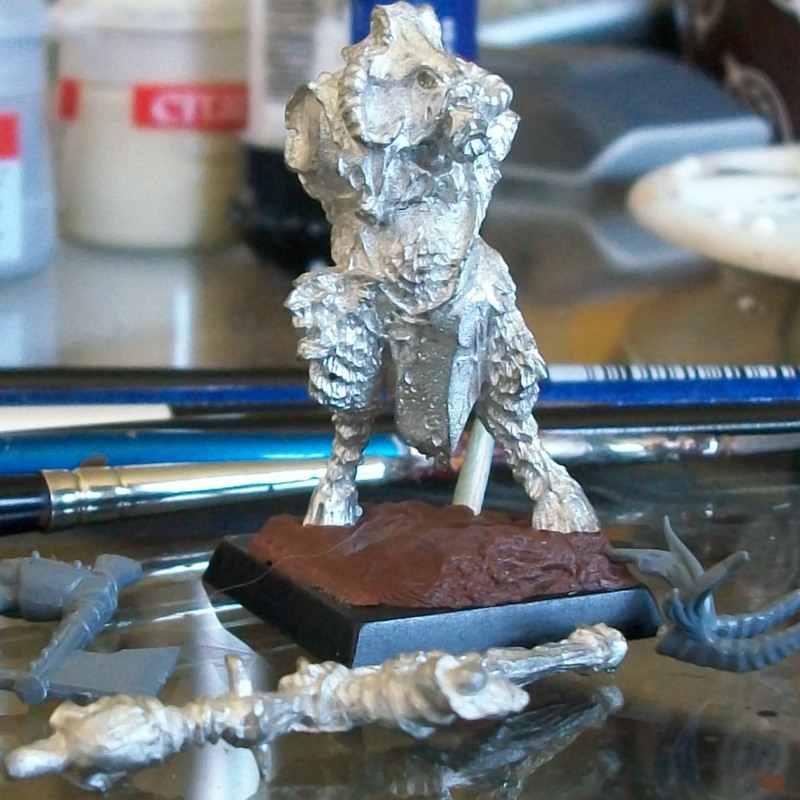 First on the list is the next Reikland Ogre. I think this guy will be a standard bearer, but I'm still deciding. When I took this pic yesterday, the armor on his back had just been sculpted. These models are such fun to do. The motivation really peaks when you see them getting close to being finished. There's so much flavor to him. My favorite part by far is sculpting interesting (and manly) looking facial hair on them. 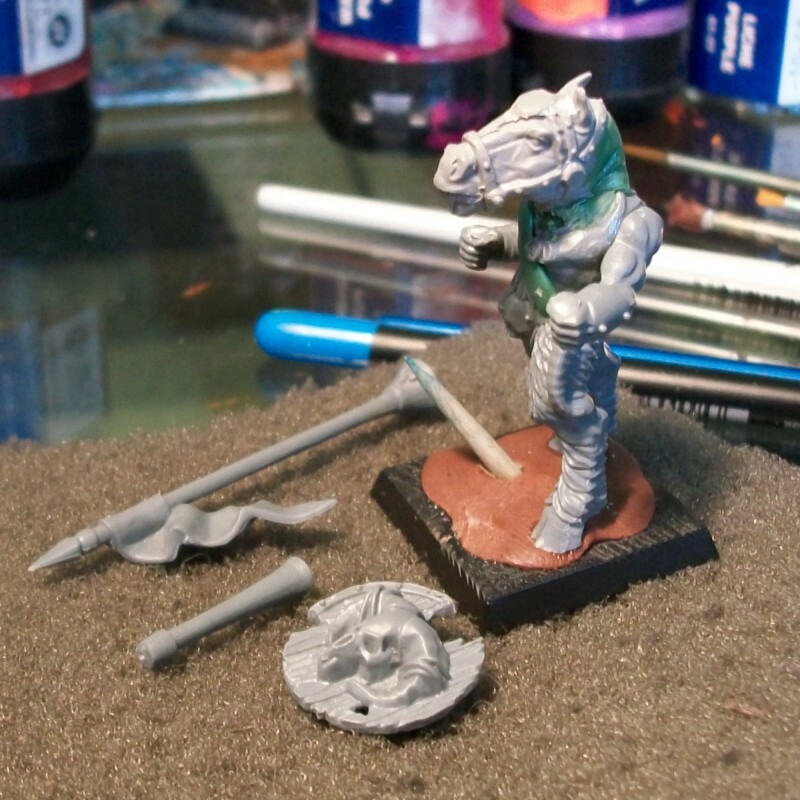 One great thing about this ongoing conversion is that you can sit down with the putty and the tools for ten or fifteen minutes of work, and then you're done for a few hours while it drys. Those short and quick sessions really encourage me to stick with it, since I don't ever work on him long enough to get sick of it. Number two on the list is the Bull Ogre BSB/Gorebull BSB. 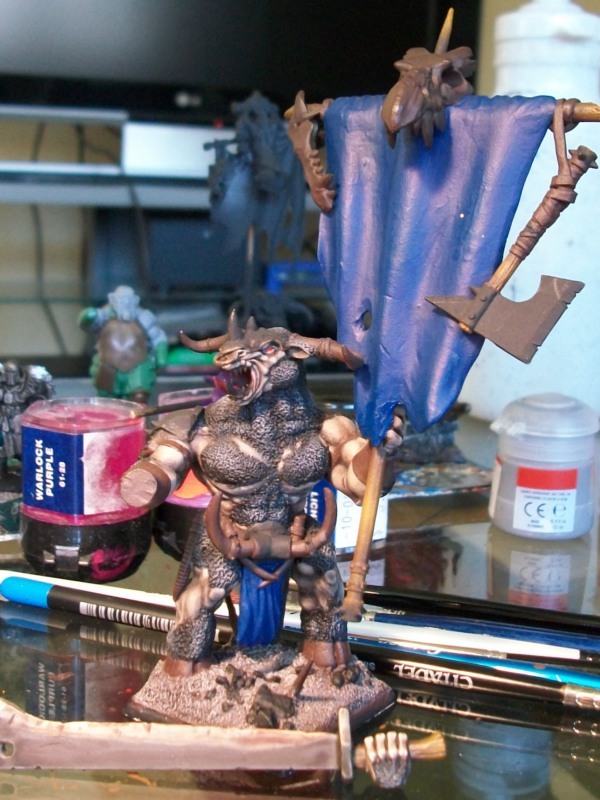 I converted this guy up way back when the latest Beastmen book came out. Then he sat in the closet because I couldn't fit him in the list. 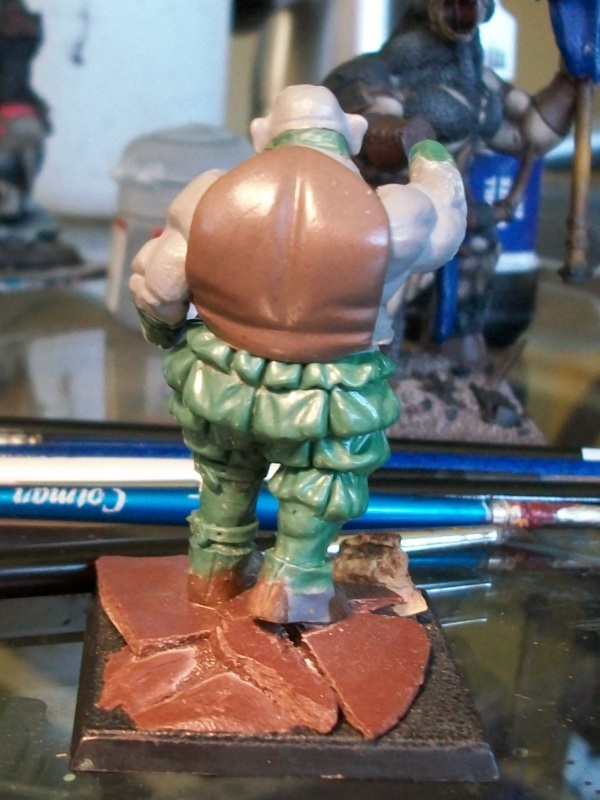 Now that I have the Bull Ogre project going though, I've been really gung ho to get him done. When I took this pic, it was shortly after finishing the highlights on his fur. Number three is the next Chaos Warrior color scheme test. Since the last one didn't quite pan out as desired, I've decided to do another. I'm really stoked to start working on the metals, but as you can see I'm still in the base-coating phase with this fella. For number four, we have a new Gor model. I have been wanting to do up some new and interesting looking Gor models for my Beastmen army for some time. Ideally I would have a second unit of 40 to throw around. I'm no where near that point yet, but I try to keep one or two in the works at all times. This guy is your classic Horsegor. 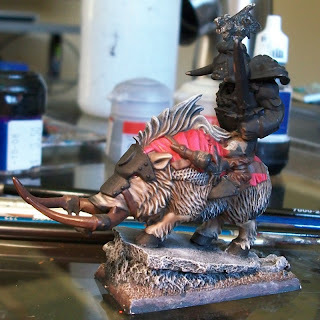 The head is off of a Bretonnian steed. I thought it would be rather ironic to give him a lance and shield, so that's how he'll be equipped. I've also been wanting to do up a few more Bray Shamans for the Beastmen, so here's number five on the list. I'm doing them much more for the fun of converting and painting them, rather than because I actually need them for games. With that in mind; I pulled this guy out of the closet, and started working on him. He's the Mordheim Bray Shaman model. I'm going to convert him a bit, since I seem to have lost one of his arms. My other Bray Shamans have some custom fire sculpted on them, so I will be adding something similar to this little guy. As a bit of variety from working on so much Beastmen stuff, I started painting up this Anvil of Doom mid last week. It falls in at number six. 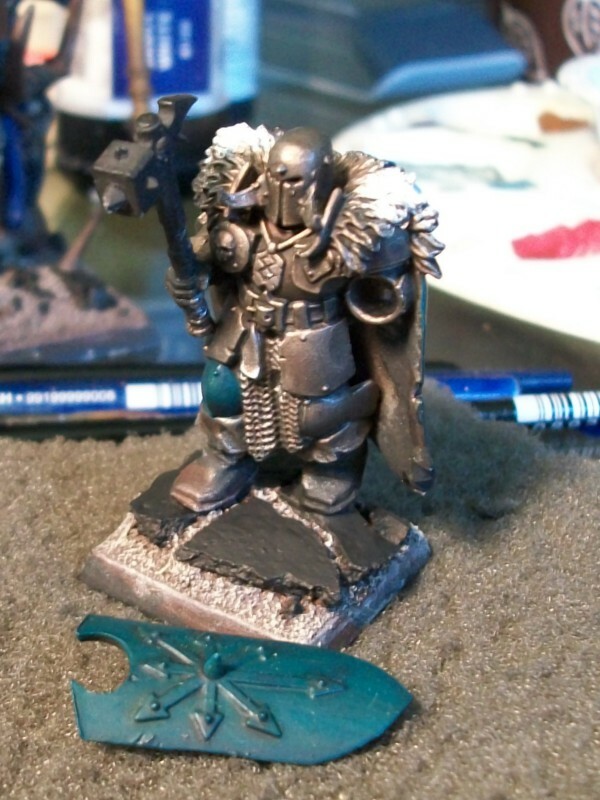 I have had this model since the 6th Edition Warhammer Dwarfs Army box set came out, way back in 2001 or 2002. I'm not certain that I would ever actually field it in a game, but it seems like a kewl project. 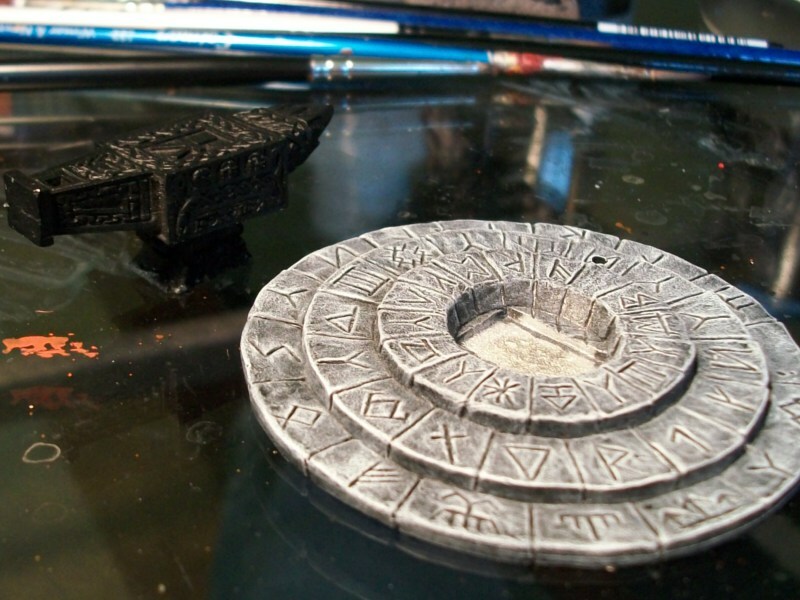 Plus it is something that I should be able to paint up relatively quickly. It's been quite a while since I've added anything to my Dwarfs army. Lastly, it's the Orctonnian BSB. 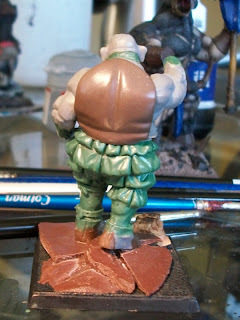 I really want him to be done, but I really don't feel like busting out all the freehand paint work that is next to do. He's been coming along none-the-less, albeit a bit slowly. Hopefully my motivation will skyrocket on him once I get a few of the above projects finished up. That's it for now. This ADD approach to modeling doesn't make for getting things done, but it does keep my hobby very interesting. I just pick up whatever I feel like working on each day when I sit down at my work station, and do it until I get sick of it. Then I grab something else that looks fun. Fortunately I don't have any tournament painting goals currently. That kind of focus is nice because you see results, but I'm rather burnt out from the crazy amounts of modeling and painting I've been doing since October. It's time for it to be fun again!